It is an opportunity to share and chat and enjoy. Last Friday we met up with brother Ian and his partner Sarah for an excellent meal at our favorite italian restaurant - Enoteca Turi. Although I&S got married last September they have been together for a number of years and I am so used to saying "partner" I find it hard to switch to "wife" or "sister-in-law". Saturday we hosted Bron and Maggie for a Chateau Leoville dinner party. 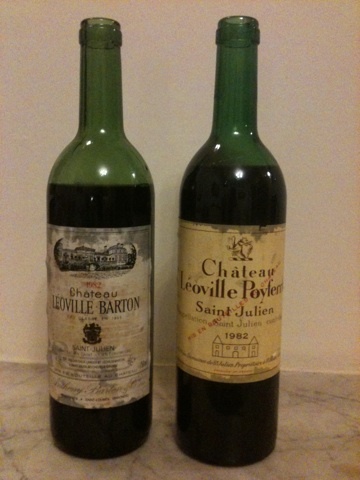 We had a bottle of 1982 Leoville-Poyferre and B&M a bottle of Leoville-Barton also 1982. So we had "compare and contrast" opportunity with two fine, mature clarets. And some excellent food to go with. Sunday we cooked a traditional roast for our Danish house guests, who had arrived on the Monday, to give them a taste of traditional English cooking. Monday Mary went out for a team meal from work. Tuesday we gave our Danes a taste of traditional Scottish food with a Burns Supper. Unfortunately they were not convinced so it will be refried haggis for us at some point. Wednesday was Mary's birthday so we went to the wonderfully kitsch, Grade 2 listed Criterion Restaurant for a pre-theatre meal. That was followed by The Children's Hour by Lillian Hellman at the inappropriately named Comedy Theatre - an excellent but intense play. Thursday we had the night off. Friday was meeting up in Glasgow with "the girls" - Mary's friends from Uni. 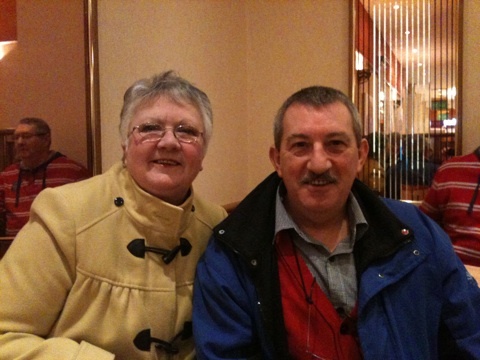 We had an excellent meal at Guy's Restaurant in Candleriggs and a real good blether. We also treated ourselves to a stay in the refurbished Grand Central Hotel just a short stagger from the restaurant. Saturday no meal of note *but* we did meet up with fellow blogger and close neighbour of May's - Lynnette "Life with the Lusks" and husband Tommy for a coffee in Irvine. Always good to meet a cyber-chum in real life. Sunday we plan a nice meal in - something we try to do every Sunday evening. A little quiet time together.